Chromium atoms in their ground state have a large spin, and a large permanent magnetic dipole moment. The long range and anisotropic dipole-dipole interactions between the atoms confer to ultracold chromium gases unique properties. An experimental platform for quantum systems simulationBy loading a chromium BEC in optical lattices, we have obtained a Mott insulator state comprising a dipolar species, and for the first time demonstrated intersite interactions between the atoms . The dipolar spin exchange dynamics which takes place in this intrinsically many-body system is in agreement with our plaquette simulations taking into account quantum correlations. Our spin system is an excellent tool for quantum simulation, with an interplay between long-range dipolar and short range Van der Waals interactions. We varied the lattice depth from the superfluid to the Mott insulator regime to investigate the coupling between spin dynamics and transport . In a chromium BEC, inelastic dipolar collisions provide spin-orbit coupling which allows thermalizing the spin degrees of freedom. Thanks to this thermalization, we have demonstrated a new cooling mechanism, based on a purification of the BEC after transfer of thermal atoms in excited Zeeman states . 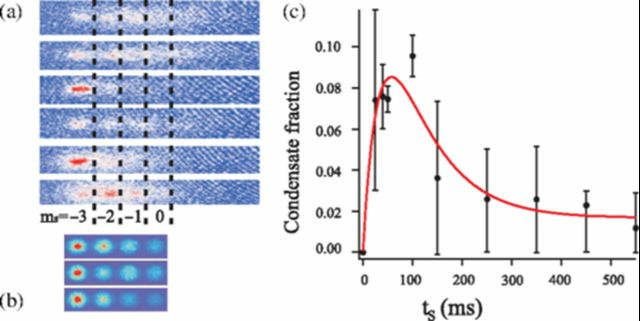 We also have investigated the interplay between spin dynamics and Bose condensation to create a multicomponent BEC when a fast shock cooling process is performed on a depolarized sample . We have obtained the first chromium Fermi Sea with the 53Cr isotope, despite low isotopic abundance, and extreme complexity of the atomic structure due to hyperfine splitting. We have taken advantage of a favourable interspecies scattering length to optimize evaporation of a Bose Fermi mixture . Loading of dipolar fermions in optical lattices offer us new possibilities for quantum magnetism studies. Production of a multicomponent spinor BEC : (a) experiments ; (b) simulations. (c) condensed fraction as a function of the shock-cooling duration. Physical Review A Rapid Communications, 93, 021603(R), (2016). Physical review letters, 115, 243002, (2015). Physical review letters, 117, 185302, (2016). Physical Review A, 91, 011603(R), (2015).